Remove any strings from the edges of the beans and top and tail them. Break them into short sections (about 5cm long). Cut the scallions at a steep angle into thin slices. Heat 2 Tbsp of oil in a wok over a low to medium heat. 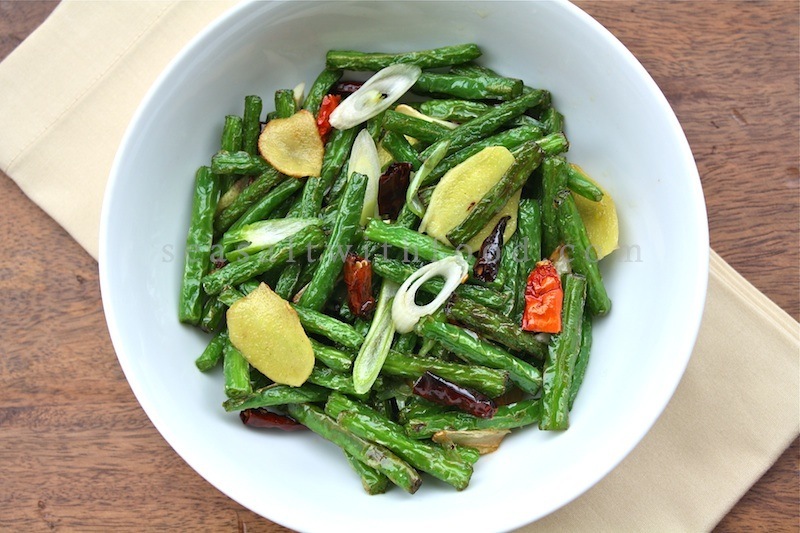 Add the green beans and stir-fry over a medium heat for about 6 minutes, or until they are cooked and tender, with slightly puckered skins. Remove and set aside. Heat 2 Tbsp of oil in the wok over a high heat. Add the chilies and Sichuan pepper and stir-fry very briefly until they are fragrant. Quickly add the garlic, ginger and scallions and stir-fry until they are fragrant. Toss in the beans and stir and toss the ingredients together, adding salt to taste. Serve immediately. Looks fantastic! Any substitute for Sichuan dried chiles? And I have to ask, what kind of sea salt do you suggest, there being so many kinds? I've always thought the beans were deep fried for this dish. I'm glad to know it can be stir-fried too. @John McCann: You can use any Asian variety of dried chilies for this recipe. The only different is the heat. I usually use Mediterranean sea salt for cooking and Maldon’s brand for salad or sprinkling. 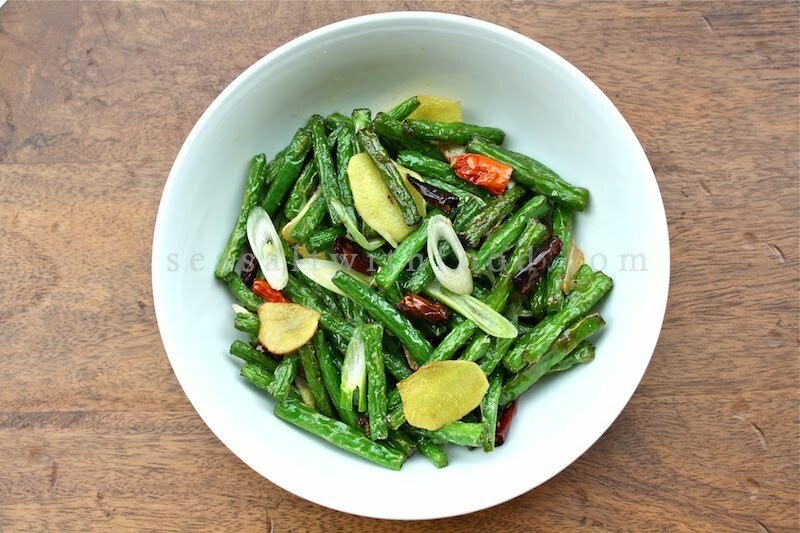 @Anonymous: Yes, the green beans can be deep-fry to reduce the cooking time. 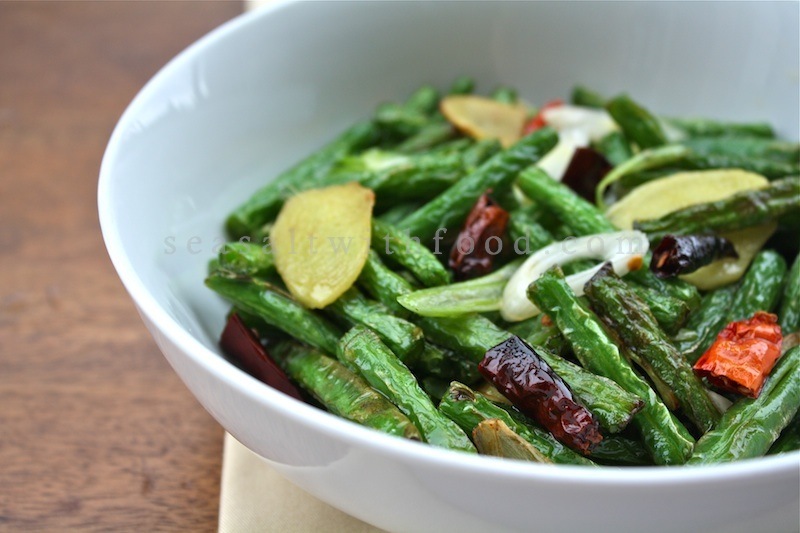 Green beans is such a great vegetable cause it could be used in so many different ways. I like your version with the dried chillies, sounds delicious! My mouth is watering just looking at the picture. This is really great and easy way to eat vegetables. I do the same with spinach and greens.